The Nelson and Tasman Regions are on my back doorstep. I live locally in Motueka near the Tasman National Park. As a "Kiwi" I am very passionate about this area as it has so much to offer for day trippers to experience the beauty of New Zealand in such a short space of time. 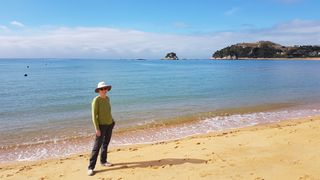 New Zealand I Drive provides private day tours and Picton and Nelson cruise ship shore tours and are about a little taste of everything. On tour you can experience some stunning beaches or short walks of the Tasman National Park. Over the hill as we refer to as locals, is the quaint and quirky township of Takaka the gateway to Golden Bay ,stunning beaches and beautiful rainforest walks. If you wish we can venture up to the top of the South Island of New Zealand and Farewell Spit .Your New Zealand Nelson Day Tour is also about flexibility on the day. If you are a wine/cider or craft beer lover, then you are in the right place. This is one of the best wine growing regions in New Zealand and the major hop growing area for craft beer exporting majority to the USA. The hills and valley are surrounded by apples/pears/peaches and plum orchards just to name a few. If you love art galleries and food your private tour can take you there as well. New Zealand I Drive is about the experience at an unhurried pace and not just a tour but an experience. Please remember I am happy to customise a tour to suit your needs, whether it be a cruise ship shore tour or a day tour - I am here to help. New Zealand I Drive providing private day tours from Nelson and the Tasman.